TV with Thinus: TV CRITIC's NOTEBOOK. More about that fascinating Johnnie Walker White Walker limited-edition whiskey bottle that is a brand tie-in with HBO's 8th and final Game of Thrones season. TV CRITIC's NOTEBOOK. More about that fascinating Johnnie Walker White Walker limited-edition whiskey bottle that is a brand tie-in with HBO's 8th and final Game of Thrones season. Diageo is making its new, limited-edition Game of Thrones inspired Johnnie Walker White Walker whiskey available in Africa - but just in South Africa, Nigeria, and in duty-free shops inside the international departures section of airports. First off, let me state that I'm not reporting on this or sharing this or covering this as part of any "influencer" deal or "sponsored post" or "partner content" - that secret cushion language meaning that you're actually reading native advertising that's a disguised advert - or anything like that. I'm not getting any money, payment or anything in return. In fact, some of the questions I asked about this product were not answered. This is genuine journalism simply because I'm personally fascinated by it, because I am a big Game of Thrones fan myself besides being a TV critic and a journalist, and because I am likewise fascinated by this smart brand tie-in idea. I took the initiative and decided to reach out to find and make contact to get some answers to things I liked to know about this tie-in and think readers who are like-minded might therefore be interested in it too. 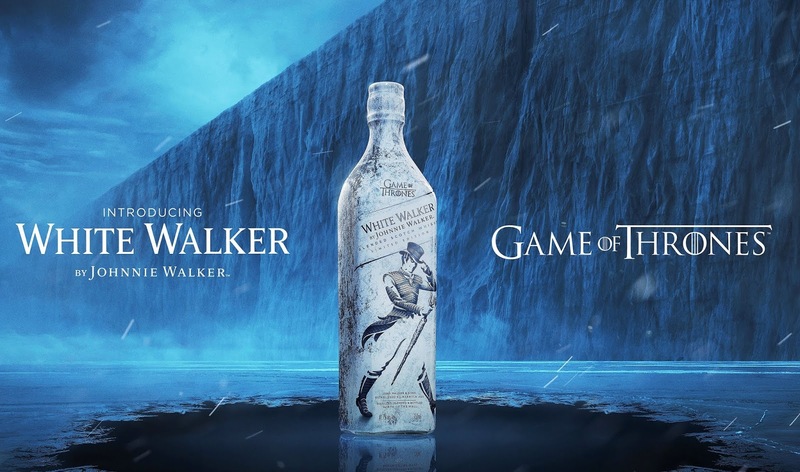 This past week TVwithThinus reported about Johnnie Walker getting ready to release its limited-edition White Walker whiskey in South Africa as well and in Africa just before the start of the 8th and final season of HBO's Game of Thrones fantasy drama series. Game of Thrones will start on 15 April on M-Net (DStv 101) at 03:00 and again at 22:00, and episodes afterwards will be made available on MultiChoice's Showmax and DStv Now Catch Up too. Well, even before I reported that this past week, I already sought out the South African PR agency repping Johnnie Walker on my own initiative and asked some questions about this fascinating brand-tie in. Yes, I do love and drink whiskey, but truth be told I'm just as fascinated by the actual bottle and how it looks, the creativity behind it, the ingenuity and technology, and the packaging to make a hidden message appear when the bottle is frozen. So I thought, let me ask and find out whether Johnnie Walker White Walker - or "White Walker by Johnnie Walker" as it says on the bottle, will just be for international consumers or also be available for South Africans, and more around what this interesting collaboration entails (because also, HBO is notoriously protective over the Game of Thrones brand). Diageo and Johnnie Walker obviously worked with HBO's HBO Licensing & Retail division to make this product possible, and it's a really clever officially licensed consumer product. The Johnnie Walker White Walker limited-edition whiskey, created by whiskey specialist George Harper is inspired by the iconic characters and the creative world of Westeros and beyond. Of course the timing is just perfect for South Africa where it's autumn and where winter is really coming and will soon be here. The White Walkers are those zombie-like, feared, icy blue-eyed white characters - an ancient magical army led by the Night King from beyond the now-demolished Wall, and set to invade Westeros. I asked about what "limited-edition" means and this limited-edition Johnny Walker White Walker whiskey is so limited that ... it will only be on sale until the 15th of April. I kid you not. "Limited quantity available thereafter, " the PR agency tells me. I asked how many actual bottles will be released into the market in South Africa and was told "we can't give out the actual number as that is forecast information which is confidential". Johnnie Walker says that inside the stark white bottles "of this new blend are single malts from Cardhu and Clynelish, one of Scotland's most northern distilleries". "Featuring notes of carmelised sugar and vanilla, fresh red berries with a touch of orchard fruit, this whiskey develops in complexity as it warms to room temperature". Something completely hilarious hidden in small print in the product fact sheet that nobody will probably spot is at the "ABV" - the abbreviation meaning "alcohol by volume". Johnnie Walker White Walker lists next to the ABV: 41.7% - "1 Throne and 7 Kingdoms". And also look closely at the Johnnie Walker Striding Man - he's now fashioned in armour to fit in among the ranks of the Night King's forces. Johnnie Walker also makes use of "temperature-sensitive ink technology" for a hidden message on the bottle that only appears on the side of the bottle when the bottle is frozen. Zumi Njongwe, Diageo South Africa's marketing and innovation director, says that being able to partner with HBO and Game of Thrones "is an innovative and groundbreaking shift adding cultural relevance and a unique way in how South Africans consume whiskey". "We are confident from a brand's perspective that our fans will love the delicious whiskey served frozen whilst watching their favourite show." Jeff Peters, the vice-president of HBO licensing and retail, says "We knew there was fan appetite for a Game of Thrones whisky and, once we saw the vision from Johnnie Walker for a way to collaborate, we knew the idea was perfect and the time was now". "From the beginning, they understood that we wanted to create something special, and they've accomplished that with White Walker by Johnnie Walker. We're confident fans will enjoy sipping this delicious whisky as they wait for season eight and beyond." Nope, I haven't tasted it but would like to. Johnnie Walker is having a media launch event for Johnnie Walker White Walker on Wednesday evening 10 April but only in Johannesburg, so I won't be there. Who knows, perhaps M-Net surprises and manages to have it at, and serve it at its 03:00 screening at Nu Metro cinemas in Johannesburg, Durban and Cape Town on 15 April when competition winners and the media will attend its simulcast screening on the big screen of the first Game of Thrones episode as part of M-Net's VIP experience and big cosplay celebration viewing party for old times' sake. Johnnie Walker White Walker really would just be the most hilariously perfect thing to drink in the middle of the night/morning as part of the "Night's Watch" to toast the final start of Game of Thrones.